Sawbridge is a tiny hamlet and consists of a small group of 17th century houses built of sandstone, with one dated back to 1665, and a few of timber framed with thatched roofs. The Grand Union Canal and Rains Brook run nearby, as did the now-defunct Great Central main-line railway track. River Leam rises at Hellidon Hill in Northamptonshire and then flows through rural Warwickhire, including the town of Leamington Spa. Eventually it flows into the Warwickshire Avon. Willoughby House was originally known as Willoughby Bath Spa, which in 1828 became the place for anyone seeking the spa water remedy for the illnesses and ailments of the day. The spa water from the mineral water springs at Willoughby House was very famous at a time when skin disorders were quite easily treated by bathing in the saline waters. Willoughby is on the very edge of the Warwickshire/Northamptonshire border and the older part of the village which is furthest away from the busy A45 preserves a pleasant sense of rural charm. This is an ancient village, being mentioned in both the Doomsday Book and the records of Magdalen College which go back to the 15th century. Willoughby has had a parish church certainly since 1215 and probably before. The present church of St. Nicholas is a Grade 2 Listed Church and dates entirely from the early part of the 16th century. The font in the church has Early English Gothic carvings on its rim and dates from 1230. The tower has a clock that may date from early in the 17th century. There are also two other former places of worship in the village. In Main Street there is the Wesleyan Methodist Chapel, built in 1898 and now used by a small business and in Lower Street a former chapel has been incorporated into a neighbouring property. Vale House, a 17th century timber framed house in Lower Street and The Smithy in Main Street are probably two of the oldest dwellings in the village. The public house in Willoughby is The Rose Inn and is at least 400 years old. Behind the Rose Inn, on the left and opposite the village playing field, are two privately owned houses that used to be Willoughby School and the School House. Willoughby has a Village Hall, which is next to The Rose Inn, and has limited parking. There is ample car parking behind the Willoughby Café on the main A45. 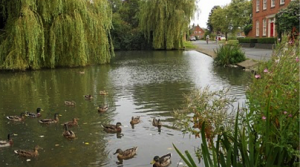 The village pond is to be found at the end of Lower Street and is home to numerous Ducks and Moorhens. The Oxford Canal and Willoughby Wharf. Construction of the Oxford Canal began north of Coventry in 1769 and it was dug through the parish of Willoughby, reaching Napton on the Hill by 1774. Willougby Wharf was established where the road to Barby crosses the canal and it was used for the wharfage of lime and coal. There used to be an Inn here at one time called The Navigation, but it is now a private residence called Navigation House. Wolfhampcote is an abandoned village and can be reached by a track from the main A45 road or by a lane from Flecknoe. The village was abandoned sometime in the late 14th century and is classified as a deserted medieval village. Today, the only remains of the village are a cottage, a farmhouse and the old vicarage, all located some distance away. The most notable surviving feature of the village is the church of St Peter, which stands apparently in the middle of nowhere, in a field. The church is managed by the ‘Churches Conservation Trust’. 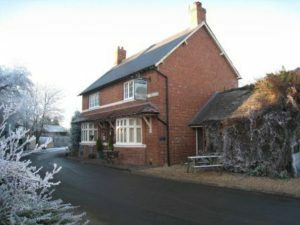 Flecknoe is a truly hidden piece of Warwickshire and is quite an isolated village, being one mile from the nearest main road (A425 Southam to Daventry road) and is connected only by narrow lanes. Flecknoe used to be just a tiny part of the much larger parish of Wolfhampcote with Nethercote and Sawbridge. Today Flecknoe is the only village left, clustered around the slopes of Bush Hill, the highest point in this corner of the county rising to some 500ft. The village has a small church dedicated to St Mark, which was built with railway money in 1891, given as compensation for the disruption to the nearby ancient village of Wolfhampcote during the construction of the now-defunct Great Central Railway. The village has a public house called The Old Olive Bush. Other notable buildings in Flecknoe are the Manor Farm House, Hillcrest House, and the Old Vicarage. The Old School building, which is now the Village Hall, was endowed to the village during the 1880’s by Mr G Tibbit. The school completely closed in 1968. In the early days of the school, water for washing and drinking was pumped up from a well by St. Mark’s Church by one of the schoolchildren and brought over to the school.